Purchase this Pretty is a Pendant below. You know the old saying "the best things come in small packages"? I, for one, believe that to be very true! And just in time for the holidays, a perfect stocking stuffer is a Crystal Allure Beaded Pendant or better still a Pendant Gift Set. 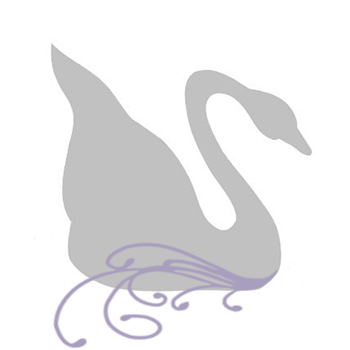 Each pendant arrives on a sterling silver chain and gift packaged in our lovely signature organza bag. Already have one, two or more of our beaded pendants and just need the pendant, without a chain? No problem! Simply email me prior to placing your order and I'll adjust the item for you. A single pretty pendant drop necklace lends a demure touch to your femininity. Pair with the matching earrings and OH-LA-LA! This is a gorgeous handmade bead jewelry gift set! 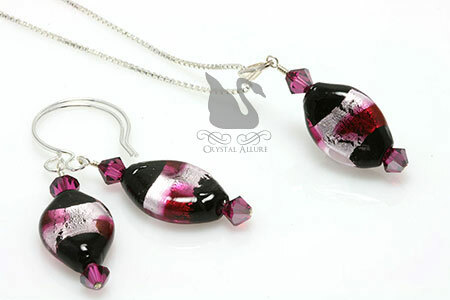 Designed with a 12x17mm artisan Venetian glass bead accented with satin fuchsia Swarovski Crystals. The pendant necklace is draped on an elegant 18" sterling silver chain and earrings are on sterling silver hoop ear wires. Both pendant and bead earrings measure at a 1-1/2" drop from the bottom of the ear wire. So pretty, Stephanie! Love the color and lustre. Looks like your creativity is enjoying your vacation! So pretty Stephanie...great color combination! Love the chunky complicated pieces but can't wear them so the simple pendant is what I wear! This set is so pretty! I love it!